Hello! I have been a major slacker on posting pictures of the kids so I have so much to share. I can't believe the holiday season is upon us again. Seriously...where DOES the time go? The past 2 weeks have been a whirlwind to say the least. First thing we marked off our to-do list was going to see Santa. 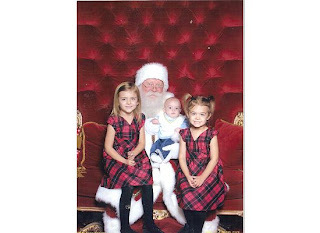 I went 2 weeks ago in hopes of avoiding a crowded mall, a long wait time and to ensure a less "germy" Santa. (The last place Bryce should be is the mall!) I planned well because Santa was just sitting there waiting for visitors. The whole process took us maybe 7 or 8 minutes. We got a cute picture, ate some dinner at good old Piccadilly (veggies!) and then headed home. Sydney asked Santa for a fishing pole and a stuffed pony. We aren't sure where the stuffed pony idea came from, but Santa is bringing an Easy Bake Oven instead. ;) Jordyn asked for a Sleeping Beauty doll and Polly Pockets. Bryce asked for blocks, cars and balls that aren't pink. Santa Visit 2008. This is not the best copy of this photo because I scanned it in. The original looks better..
As you can see...Bryce did not like being a stocking stuffer. On the other hand I have no trouble getting the girls to pose for pictures. The next thing we marked off our list was taking our Christmas card photos. Missy was kind enough to come to the house to snap pictures of us. They turned out great. The family picture shown is not the one we used, but just one of the many great shots we got. THANKS MISSY!!! You rock! Both of the girls celebrated Thanksgiving at school last week. Jordyn brought corn on the cob to share with her class. Sydney brought muffins to share with her class. All of the Kindergarten classes sang songs for the parents before their fest. It was very cute. Bryce is 4 months old and pretty cute at that! Bryan and I have had a pretty productive week so far. The girls spent the night out 2 nights this week so that MIGHT have something to do with it! Bryan finished the tile in the basement bathroom (only needs the sealer now) and got the rock on the wall going down the basement stairs. The rock wall looks amazing. I can't wait to see it finished. Bryan has been moving on things in the basement these past 3 days. Hopefully the progress will continue since we have officially been working on the basement build-out for a year. Whew! (I say "we" because I have helped some...I've done most of the painting). I finally got the kids rooms cleaned and organized this week. All three of the rooms were trashed. Sydney and Jordyn are like little tornadoes when they hit a room. It's almost impossible for me to keep a clean house with them around. I officially moved all toys (except baby toys) out of the nursery. The rule is the girls are not allowed in that room. We haven't really cared if they played in there in the past since Bryce has been in our room, but for the past 2 nights he has been sleeping in his crib. He made the transition with no problems. I think I had a harder time with it than he did. My little man is growing up. Sigh. The rock wall...no grout yet, but I think it's looks so good. Nice job Bryan! Bryce went in for his 2nd dose of the Synagis shot today. I have been very concerned about him because he has been sick. He has been so congested and miserable. At night it's worse and he gets so frustrated that he can't sleep. I had the doctor check him over to make sure his lungs were doing OK. This morning I was worried that his cold had moved into his chest because I could hear him wheezing, but the doctor assured me he was fine. He is simply fighting a cold just like everyone else these days. He has a nasty cough, but the doctor said it's just the head congestion breaking up and dripping down his throat. I am sooo happy that it's nothing more than a cold. They did advise to start the breathing treatments 3 times a day until the cough goes away, which is not a big deal at all. The nebulizer (neb) is easy to travel with so we won't have to come home in between our visits on Thanksgiving. The other great news from our appointment today is that Bryce weighed in at 13.23 lbs! He is really chunking up. I supplement two 4 oz formula bottles a day now and he gets cereal with those feedings. The rest of the time he nurses. So this pretty much wraps up everything. I tried to keep this as short as possible. I hope everyone has a wonderful Thanksgiving. Are any of you doing the whole get up at 4:00 am thing??? I usually go, but have yet to see anything in all the sale flyer's that we can't live without!